For those who live and love the country lifestyle. Steinhauser’s is truly the modern-day general store for those who live and love the country lifestyle. We carry everything you need to raise healthy horses, care for your pets and wild birds, and maintain flourishing lawns and gardens, as well as clothing and accessories and just about everything in between. You can find Steinhauser’s stores throughout the greater Houston area including Alvin, Brookshire, Hempstead, Magnolia, Navasota, Richmond, and our headquarters in Sealy, Texas. 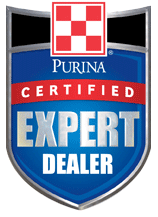 We are a certified expert Purina Mills dealer, and we’re your first place to go for Purina dog food and Purina horse feed. Purina Mills has been the leader in animal health for generations. With over 100 years of research and innovation, they are dedicated to producing feeds of an uncompromising quality, and to advancing the science of animal health and nutrition. Steinhauser’s takes special orders at all our stores for almost any type of product. If we don’t have it, we will do our best to get whatever our customer needs. Just ask us! Looking for delivery or bulk feeds, we have you covered. Steinhauser’s Sealy location has truck scales weigh trucks and/or products and liquid fertilizer, the Hempstead and Alvin locations carry propane gas, and the Hempstead location has a groomer onsite! Our stores have you covered for all your pet, feed, and ranch supply needs! Steinhauser’s carries the finest feeds in the industry, and we deliver them to you!